Kids never forget catching their first fish as they begin a hobby that can last a lifetime. Wide-eyed excitement. Dancing-in-place exuberance. Yelping joy. That kind of enthusiasm marks the magical moment when a kid catches a fish for the first time. Witness this rite of passage involving a wiggly prize and unabashed pride, and you won’t soon forget it. Neither will the child. Lasting memories—that’s the power behind youth fishing. It helps explain the national trend of programs introducing youngsters to the pastime. Wherever there are mountain streams, inland lakes, coastal marshes or open seas, there are guides glad to share a contagious interest in angling. Why take kids fishing? It gets them off the couch, into fresh air, active and away from TV and video games. It surrounds them with nature, stimulating their curiosity about the outdoor world. It nurtures practical skills ranging from navigation to knot-tying through hands-on encounters with boats, rods, reels, hooks, lines and sinkers. It builds character, teaching patience when fish aren’t biting and an understanding of life and death in food-chain terms. It provokes one-that-got-away storytelling, a cherished anglers’ art. If parents join in, add quality time to the equation. But mostly, fishing is just plain fun. 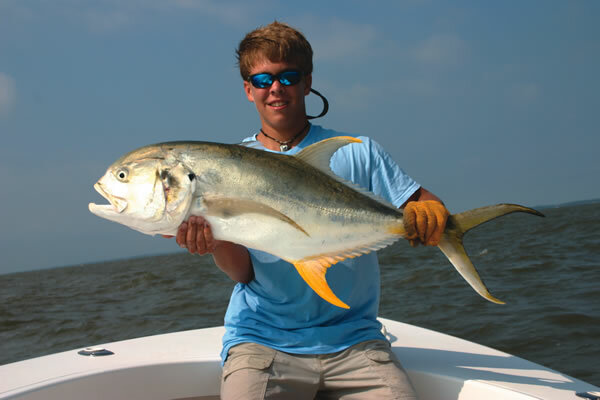 Around Georgia’s barrier islands—where shallow waters teem with redfish, yellowtails, blue crabs, croakers, flounder, trout and sharks—youth fishing has never been more popular. Kids line the dock daily behind The Cloister at Sea Island, casting rods and lifting crab traps for a look-see. Some of those dock-hounds join excursions led by Kennedy and other Sea Island guides aboard 27-foot, single-engine, Georgia-built, Rambo boats holding up to six passengers. 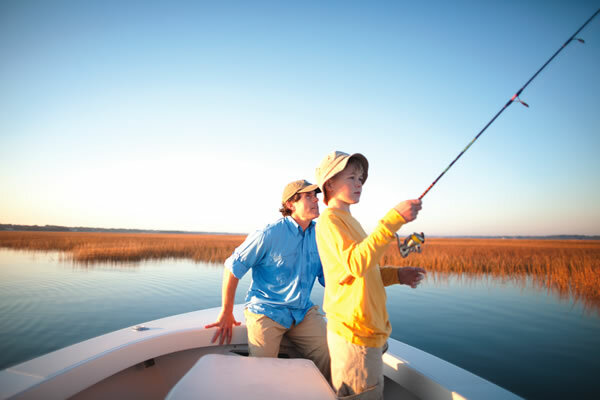 “Two-hour trips are perfect for beginners.We head to nearby saltwater marshes or St. Simons Sound in search of catching fish,” Kennedy says. “We make it easy. All they have to do is show up at the dock, step on board … and pretty soon they’re catching some fish. If they want, we’ll even bait the hooks for them.” Youngsters and their parents are often hooked after their first fishing trip, prompting them to sign up for three or four more trips that same week. Keeping kids interested is easy. “There’s never a dull moment, so they don’t get bored,” Kennedy continues. “If the fish aren’t biting in one place, we move to another, taking turns steering the boat. We spot dolphins, bald eagles, stingrays and sea turtles. We watch least terns dive straight down for minnows. As a testament to fishing’s popularity, Kennedy explains that his crew leads more than 1,200 trips per year, adding up to about 4,800 people participating in the pastime with guides at the resort annually. The high season is typically from March through August. “It’s really become a popular activity here,” Kennedy says. “Kids like quantity,” he says. “My office door is covered with their thank you notes, and one guy who caught 137 fish drew 137 little fish on his card! A few fish get taken home or to a Sea Island restaurant to be cooked. When kids eat what they caught, that’s a powerful lesson in where food comes from.” What’s not used for meals is released back into the water, which is the majority of fish caught.